As an Official Tour Operator for L'Etape du Tour, we offer the chance to experience this iconic event. 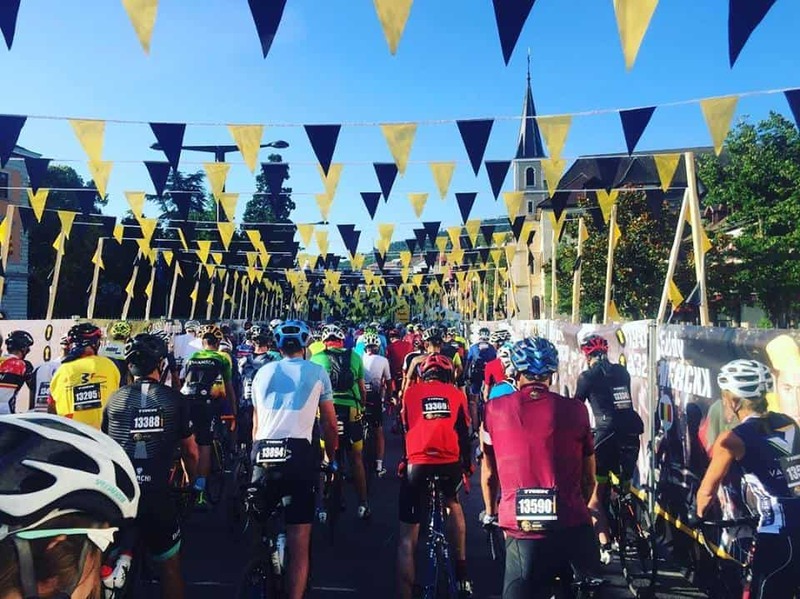 The 2019 event starts in Albertville and lets you tackle Stage 20 of the 2019 Tour de France one week before the Pro's! Its a stunning route which sees you climbing the Cormet de Roselend with its superb views over the crystal blue waters of the Lac de Roselend. You then descend into the valley to take on the climb of the Notre Dame de Pre. Another descent awaits before you hit the long, challenging climb up to Val Thorens. Hôtel Edelweiss and our Chalet accommodation is located in the fantastic mountain village of Saint Martin de Belleville. At 1400 meters altitude, it sits on the final climb of the Etape du Tour which means you only have a short downhill spin back to the hotel after you have crossed the finish line in Val Thorens. From our client feedback & experience, a Thursday arrival lets you set up your bike and relax. You also avoid Friday madness at the Airports! On Friday we can explore the local climbs and recce the final climb up to Val Thorens to get you prepared for the event on Sunday. Spaces are extremely limited and we can take care of the logistics for you. The event is always a sell out. Geneva Airport is where we will run transfers from. Its served by all major airlines. We will have set pick times so get in contact to discuss suitable flights. Transfer time is approximately 2 hours to Saint Martin de Belleville. Taking your bike abroad ? www.sherpr.com can ensure you get your bike to The Etape du Tour. They send you a bike box to pack your bike into, arrange pick up and ensure it arrives safely and is ready to race in France ! Cost is from £160 per box. £200 booking deposit required in order to reserve your space. Please be aware that deposits are non-refundable. Sitting at the entrance of the Vallée des Belleville, this small village allows you to explore the area. It rests at 1450m altitude and is located along the road of the final climb up to Val Thorens. It is a traditional Savoyard village with a pretty church, small square and some delightful restaurants as well as a few bars. We recommend flights into Geneva. Airport pickup is at set times so please check before booking your flights. With 15000 Etape du Tour cyclists in the local area, demand is extremely high over these dates. Full balance for Etape du Tour is required 10 weeks before the date of travel. We also require the names, contact numbers and email address of the members of your group. L'Etape du Tour requires you to provide a current medical certificate when you pick up your race pack on the day before your ride. To take part in the 2018 Etape du Tour you have to get a medical certificate signed by your doctor within the last year from the event date. This is a legal requirement and failure to comply will mean you are cannot participate in the event.